Camping has gained a lot of ground over the past few years. There are even various forms of camping like dry camping, backpacking, and adventure camping among others. This has led to a significant increase in the number of adventurers. Such activities must always be accompanied by certain tools that will ensure you enjoy somehow the same comfort that you could have enjoyed at home. One of the most critical tools for such activities is the backpacking tents. The backpacking tent under $100 will ensure that you are “home” at considerably low costs. Apart from just the comfort, your safety is also guaranteed. You will, therefore, have to carry along with you these backpacking tents. 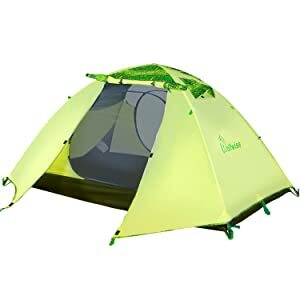 When you are in the market looking for a new tent, you will realize that the options available are so many and hence you might face a lot of difficulties when trying to choose the best one. The search becomes even harder when you have to look for the best product at an affordable price that is below $100. This article will, however, will make everything much easier. All you need to know about the best and most affordable backpack tents is going to be discussed below. The ALPS Mountaineering Lynx Tent for one person bags the top price in this category. The ALPS brand has been proven over time to produce the best quality backpack tents. It is the best among the best. It has topnotch features that an ideal backpack tent should have. The pole clips can be attached so quickly onto its freestanding design making it easy to set up. This tent has a vestibule that ensures extra storage space and the door is fitted with extra-large zippers. To increase ventilation inside the tent, its wall is mainly made of mesh. The corners are not cut, and at the same time, the ALPS tent has floor seam and factory sealed fly of 2000mm that helps protect against extreme weather conditions such as rain showers. Other accessories that are included with this purchase are the guy ropes, gear loft, the 7075 aluminum stakes and the storage pocket made of mesh. It has a net weight of 3.94 pounds. Its measurement of 36 by 90 by 32 inches results in a larger floor area. This product qualifies to be out best pick because of its great qualities that have been discussed above coupled with the fact that it comes at a reasonable price. Small in size and hence meant for only one occupant. If you find our pick product a bit expensive and smaller in size, then this is the best alternative for you. The WolfWise Tent caters for these limitations. 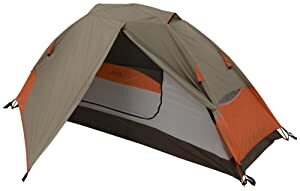 Also, this is one of the best 2 person tent under 100 dollars. It provides the best alternative to our top pick as it is cheaper and can accommodate two people at the same time. This tent is lightweight and, therefore, is easy to carry along when you go camping. It is durable enough and can be used for three seasons. The pole design is shock-corded making assembling of the tent easy and quick. Be sure of a waterproof shelter in any kind of environment once you are done with the setup. This product has been made from polyester that is anti-tear (19OT). The walls are made of mesh with stitch taping and double-stitched seams to provide sufficient ventilation into the tent. The tent floor is also waterproof and will resist even pouring rains. The lightweight feature of this tent is a result of the poles made of aviation-grade aluminum. They, however, provide structural support that will surely last. A USB LED string has been included on the roof for lighting purposes. Easy entry and exit is made possible by the two oversized doors that are aligned to cover rain. During dark nights, access is made easy by the fluorescent buckles. The tent measures 82.7 inches by 55.1 inches by 43.3 inches. Other accessories that accompany this product are a rain fly, wind rope; roof light, 8 tent stakes, carrying bag and 2 shock-corded poles. Shorter for persons who are more than four feet tall. We cannot really afford to miss out on the budget-friendly backpacking tents. There are generally those high-quality products that are cheap as well. The DKISEE backpacking tent is the cheapest product in this area. However cheap it is, you will be amazed by its well-designed features. If your budget won’t allow you to buy the other tents, this will be your ideal alternative. The tent is made of polyester coating that is durable. It helps keep you and the camping gears dry and safe. The roof, door and windows are made of mesh to provide maximum ventilation and protection against insects and pests. The zipper features a large door that is semicircular for easy access into the tent. It is extremely light in weight and, therefore, perfect for travel camping and hiking. This makes it easy to set up. The two ventilation skylights and the in-built chandelier hooks enable you to have a view in the night. It is both waterproof and windproof due to the high-quality cloth used. You can conveniently store your daily necessities in the inner pockets. Stability during rainy seasons is ensured by the high-strength frame that is made of fiberglass. The tent is easily disassembled, folded and put back into its carrying bag for easy transportation and storage. It measures 79 by 59 by 47 inches when open but can be folded to 24 by 4 by 2 inches for easy storage. Its weight is just 3.7 pounds. Accompanying components are flysheet, inner tent, carry bag, 4 wind ropes, 4 nails and 2 poles. Disassembling can be so tough at times. There are those who generally like the most expensive products in any category of goods. Or do you have an extra amount of money that you need to spend on a backpacking tent? Then the Hyke & Byke Zion tent is the product you need. It comes with the comfort that is necessary for both camping and backpacking. A lifetime warranty has been slapped on this tent properly showing the manufacturer's confidence has that it will rarely underperform. In case of any defect, the tent will be replaced by another one. The aluminum alloy stakes make this tent lightweight and at the same time durable, lasting for up to 3 seasons. The mesh walls are ultra-light. 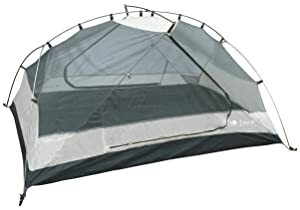 Setting up of this tent has been made easy by the freestanding ultra-light design, stake presser that is proprietary and the reflective guy that has tension lock cord that is adjustable. The single pole has Clip-pole attachment that not only ensures easy setup but also improves on the breathability. The footprint (PU 5000) and the detachable mesh ceiling pocket have been included with this purchase, however, much they cost more. It is designed with features such as bathtub floor, rainfly (PU 5000) and the seaming tapped floor that keeps out rain during stormy conditions. The two doors make it easily accessible. Additionally, the vestibule design and corner pockets are additional spaces for storage. It can be disassembled to a small pack that can be carried easily for camping trips. It accommodates two people at the same time. This tent weighs 5.5 pounds. Can be disassembled into a small pack that is easy to carry. Having looked at some of the best backpacking tents, it is now important that we look at the features that make them stand out as compared to their counterparts. These same features will at the same time offer great help when you go shopping for a new tent. Lightweight tents are easy to carry. They make hiking more fun and basically that is what hiking and camping should be like. A tent weighing a few pounds and ounces will work best for you. 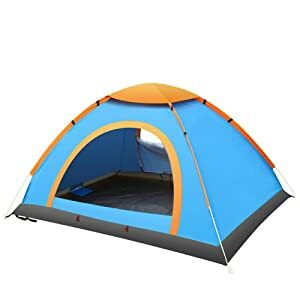 The tent should have the least weight possible because there are also other stuff like sleeping pads that you will also have to carry along. The tent weight should not necessarily mean the tent size as there are currently lighter tents that are spacious enough and comfortable. Take note that your tent’s stability lies on its seasonality and not the weight as often thought that the heavier the tent, the more stable it is. The ultra-light materials used on these lightweight tents can be specially designed to provide more stability. Most backpacking tents are either three seasons or four seasons. However, the most common ones are the three-seasoned ones. They are ideal for most weather conditions and climates. They work best in spring, summer, and falls. They are made of mesh that allows for proper ventilation. They can, however, withstand light snow and cannot, therefore, be used in places of harsh storms, heavy snow, and violent winds. The four-seasoned tents are designed for more extreme weather conditions such as high winds, very low temperatures, and heavy snow. They are, however, heavier than the three-seasoned tents. They are fitted with features to help make them more sturdy and able to withstand such conditions. The backpacking tents are categorized into different capacities depending on the number of occupants it can accommodate at ago. The one-person tents are light and are meant for solo adventurers. It makes you hike faster. If you are a bit huge, then you can try the extra wide and long one-person tents. The two-person tents are a little bit larger in size to accommodate two people. They are the most common type. The higher capacities are however too crowded but at the same time perfect for more hikers who would require more space. The tents that offer extra pockets for additional storage of daily necessities are also highly recommended. A backpacking tent that is easy to assemble and disassemble saves you a lot of time. Freestanding tents are quicker and easier to set up. They are designed with fixed poles that can be set up on any ground. The non-freestanding tents are on the other hand lighter since their pole structures are not robust. They, however, require more space and time to set up. You will have to do a lot of practice to master how to set up such tents properly. Tents are very important in enjoying outdoor activities. They will make sure that you have a home away from home in the wilderness. To acquire a good tent, there are some factors that one must consider. Most of those factors have been addressed in this comprehensive review article. All the tents under $100 discussed above will work well for you. The ALPS Mountaineering Lynx Tent happens to be the best backpacking tent for you. It is easy to set up due to its freestanding feature, well ventilated by the mesh walls and easily accessible through the extra-large door. Its sufficient interior area is for one person. Additionally, it is also lightweight which makes it easy to carry during hiking. There is an extra storage feature provided by the vestibule. With its fly sealed and the floor coated and seamed, it keeps you dry even if there are rain showers. These outstanding features make it the best. We would, therefore, like to recommend it for your future camping plans. It will surely not disappoint. Have you ever bought any of these backpacking tents under $100? If yes, which one did you buy? How can you describe how it performed? Do you intend to buy any of the tents that we discussed above?